Foodmantra: If Chillies Could Kill. I'd be A Dead Woman. If Chillies Could Kill. I'd be A Dead Woman. A tangy and spicy, coconut-based prawn curry. This Mangalorean curry uses two kinds of chillies, madras chillies and begdi chillies which are easily available in West and South India. 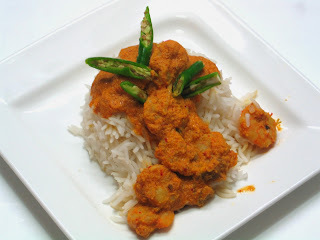 If madras chillies are unavailable, Kashmiri chillies can be used. Coriander Seeds (Sabut Dhaniya) 1 ½ tbpsn. Cumin (Jeera) 1 ½ tbspn. Carom Seeds (Ajwain) ¼ tspn. Fenugreek Seeds (Methi Seeds) ¼ tspn. Vegetable Oil (Tel) 2 tbspn. On a tava, dry roast coriander seeds, cumin, carom seeds (Ajwain), fenugreek seeds (methi), begdi chillies and madras chillies. In a grinder, add in freshly grated coconut, tamarind paste, garlic and the roasted spice mixture. Grind this mixture into a smooth paste. Heat oil in pan, add in chopped onion, grated ginger, green chillies and sauté for a minute. Add in the prawns, turmeric and salt. Cook the prawns till they turn white and curl up. Add in the coconut mixture to the prawns. Stir in two cups of water to the pan. Let the curry some to a boil and then simmer for two minutes. Turn off the heat. Serve hot with steamed rice. Hot Green Puris on a January Morning! !